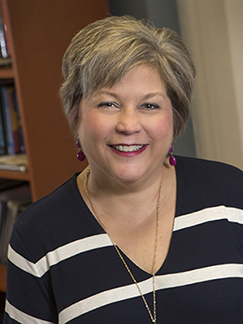 Lisa Scott, a three-time alumna of the University of Nebraska-Lincoln's speech-language pathology program, was recognized with Florida State University's 2016 Distinguished Teacher Award, the university's top award for teaching. Nominations for the award are initiated by students and reviewed by a faculty committee, which makes the final selection. "All three of my degrees are from UNL, and all from the Department of Special Education and Communication Disorders," Scott said. "Being taught by world-class faculty such as David Beukelman, Charlie Healey, Dixie Sanger, John Bernthal and Tom Carrell gave me a perspective on the kind of instructor I wanted to be for my own students as my career has developed." After receiving her bachelor's degree in speech-language pathology and audiology at UNL in 1987, Scott earned her master's degree in 1988 and her doctorate in 1997, both from UNL in speech-language pathology. She also spent four years as a clinical instructor at the Barkley Speech Language and Hearing Clinic from 1993-97. "An important part of my job now is clinical education, and again I was fortunate to have been mentored by some of the best - Gayle Ellis, Steve Boney and Toni Morehouse immediately come to mind," Scott said. "These individuals reinforced to me the importance of being a clinical scientist and lifelong learner, and that students need mentors both in and out of the classroom." Scott, a research associate in FSU's School of Communication Science and Disorders, has also served as the director of clinical education in the L.L. Schendel Speech and Hearing Clinic since 2010. A fellow of the American Speech-Language-Hearing Association (ASHA), she received the Award for Continuing Education (ACE Award) from the organization in 2014. Scott has also been recognized with various teaching awards at Florida State four times previously during her career. "Anything that I am able to offer my students is a direct reflection of what was offered to me during my time at UNL, and I am so proud to be a Husker."